The goal of zeroing your scope is to align your point-of-impact with your point-of-aim. You need to do this every time you mount a new scope on your firearm. Some people find it a tedious task as you can spend some time (and ammunition) chasing your zero. But worry not, with my tips, zeroing any type of scope on any firearm is going to be a breeze. Note that you should already mount your scope properly before zeroing. 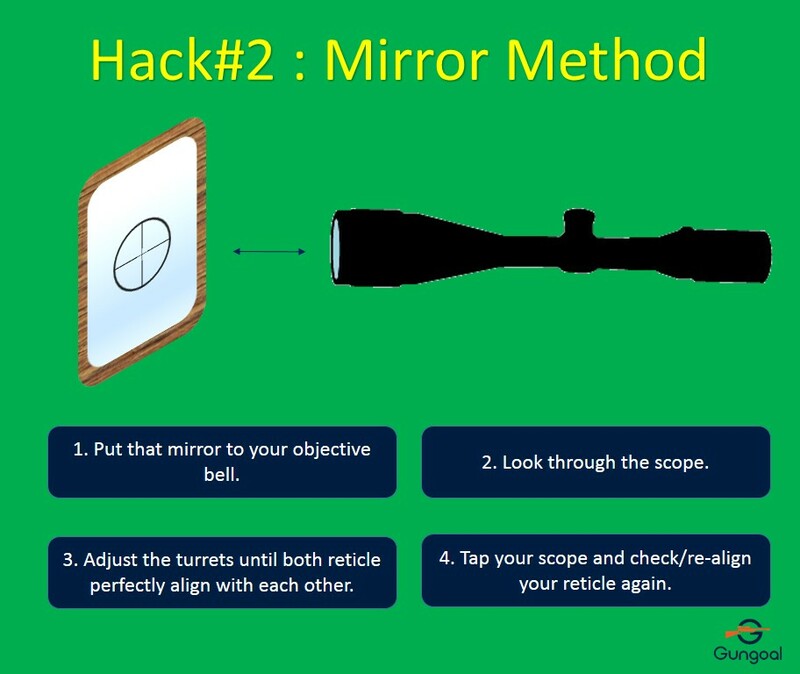 If you haven’t done that, refer to “How to mount your scope”. When should you check your zero again? Want to use this image? Feel free to grab this code! *You can use Strelok app, Nikon Spot On App or Sportsman’s Guide Ballistics Charts to find out your bullet trajectory and decide on your point of impact. 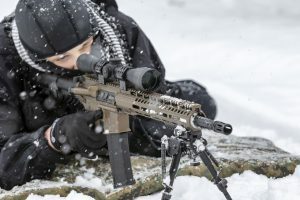 If you’re interested in shooting long range but don’t have a long range scope, see Best Long Range Scope and Long Range Scope on a Budget. Boresighter – Don’t have one? Get it from Amazon or read more about it from Opticsplanet. If you don’t want to spend any money on this, there’s a hack to boresight for free in this article. 5 Target paper with inch grid – Print for free from Opticsplanet or buy it from Amazon. Screwdriver, coin, flathead – Only if your turrets need these to adjust. 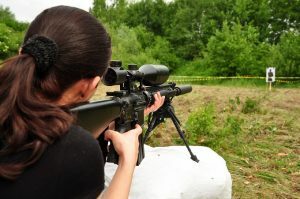 First, you should adjust your reticle to your eye using the fast focus eyepiece or the diopter adjustment which is the ring located nearest to your aiming eye. The end result should be a clear reticle the instant you look through the scope. Find a clean background such as a blank white wall or a clear blue sky. Look through the scope (in your shooting position) at a clean background. Turn the reticle focus knob in or out to get a clear reticle. Don’t look through the scope for longer than 2 seconds as your eye will auto adjust to the reticle. Re-adjust your eye by closing it and look at other distance for a while then look through the scope again. 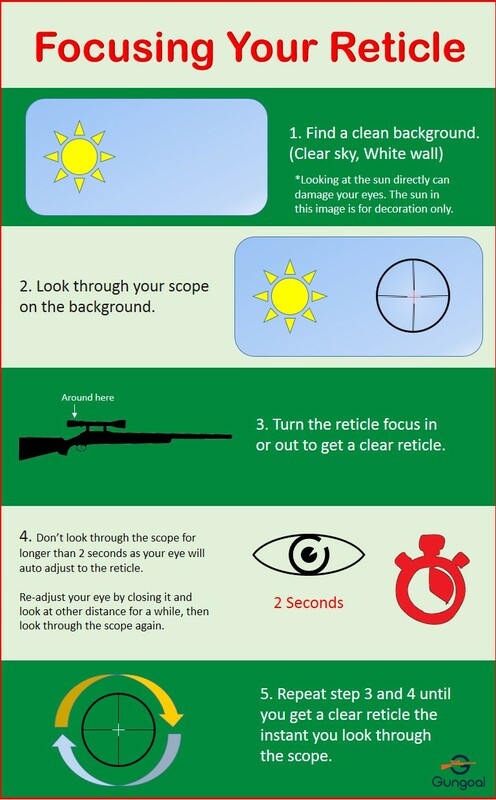 Repeat step 3 and 4 until you get a clear reticle the instant you look through the scope. 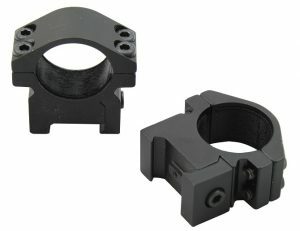 Looking for a scope for your AR-15? See Best AR15 Scope. The goal of boresighting is to make sure that when you get to the range, you can land hits on paper target. 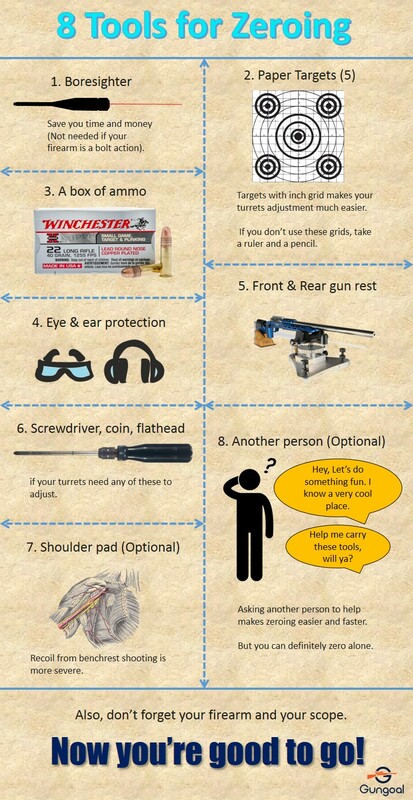 Simple as it may sound, this process can save you time and money at the range. Furthermore, it can tell whether you need to adjust your mount or not. Mechanical zero is useful to determine whether your need to fix your mount or not. If you need to adjust your windage (right turret) a lot, then either your mount is not straight, or your scope windage turret is broken. Consider adding a shim. If you need to adjust your elevation (top turret) in the “up” direction a lot, and you want to go long range. Consider adding a shim. The reason for tapping is to make sure the spring mechanism inside the scope functions properly. This method used to be the norm in the past when scopes quality were not this good. That said, lower priced scopes and old scopes do benefit from this method. A caveat is that you don’t tap the scope too strongly especially on the cheap ones as you may break it. In this method, you’ll actually be shooting at a very big target at 25 yards to ensure that you will definitely hit somewhere on the target. Find a safe place to shoot (Check what’s behind your target). Place the cardboard at 25 yard range. Set up your firearm on a benchrest. As a general rule, do not let the barrel contact any object. Put on your eye and ear protective gears. Tap your scope and check/re-align your reticle again. For this method to work, your mount system must be precisely correct. The idea is that as long as your scope is mounted correctly, you just need to put the reticle on the exact center of the scope. You should see 2 reticles, one from the scope and another from the mirror. Adjust the turrets until both reticle perfectly align with each other. This method is least reliable as it requires precise mounting. If you want to save on boresighters, maybe you want to save on optics too. Find out about Best Scope for the Money and Cheap Red Dot Sight here. Note that you can do this alone, but bringing a friend will make the process easier and faster. Also, if possible, pick a calm day with very light or no wind. Looking for a great hunting scope? See Best Hunting Scope and Best .308 Scope. Some scopes allow you to index your zero settings by re-adjusting your turrets markings without moving the reticle. This reduce the need of remembering clicks in the field. You can temporary adjust your turret to your needs, then dial back to your zeroed position with ease. Consult your scope manual on how to achieve this. If your scope doesn’t have this function, you can simply DIY your own markings with everyday stationary sticky notes. See this video for a great example. 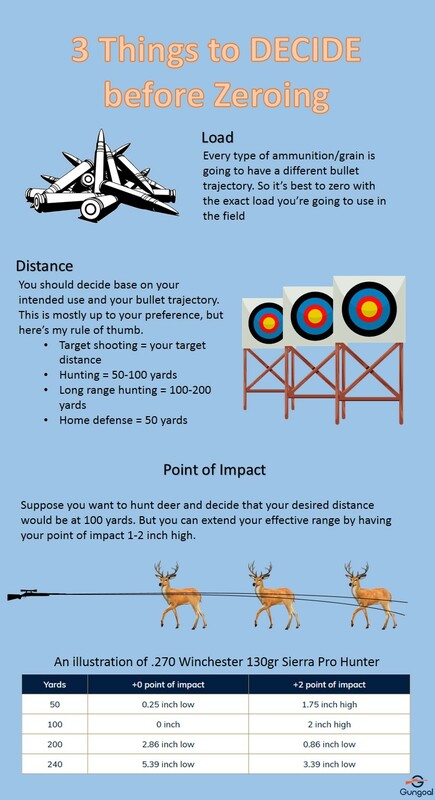 It is useful to know your point of impact at various ranges. You can use Strelok app, Nikon Spot On App or Vortex Long Range Ballistic Calculator to approximately find out your bullet trajectory. Then save the data in your phone, write it in your notebook or print it out and glue it to your gun stock. 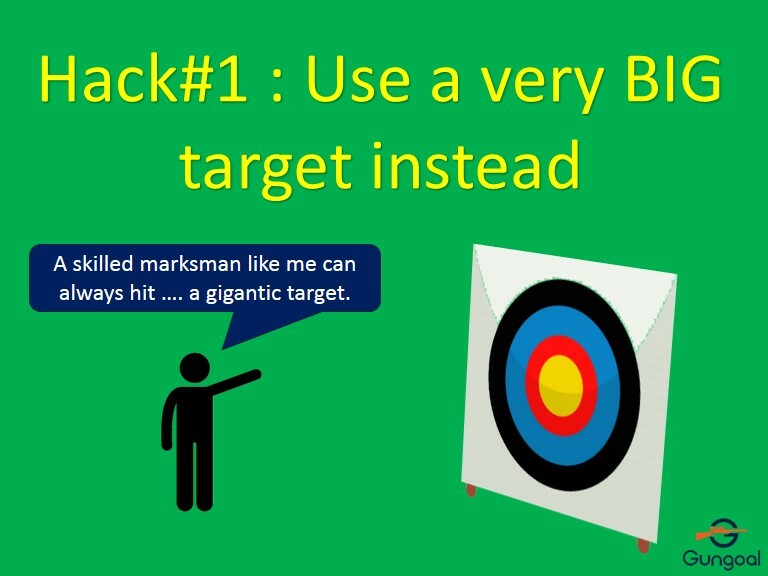 But to be precise, you still need to try shooting at those distances. If you have BDC reticle or Custom-Dial turrets, now is also a good time to try that out. “My shots aren’t consistent at all.” – The scope is not well mounted – Check your mount again. – The turrets are broken – Contact your scope’s manufacturer. – Bench rest is not stable enough – Re-adjust your bench rest. – Check that all screws on your firearm are properly tightened. 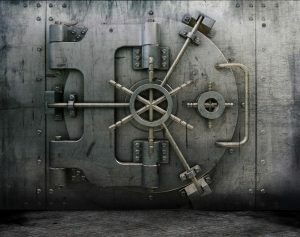 – Check the rings whether they are correctly torqued per the manufacturer’s instructions. – Some firearms and ammunition don’t work well together – try different ammunition and see if accuracy improves. 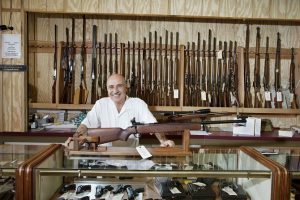 – Be sure that your firearm is clean and free of excessive oil or copper fouling. – Your shooting techniques may need improvement. “I maxed out my elevation/windage adjustment and couldn’t sight in.” – Check whether the scope is properly mount. – The firearm may have barrel issues. Want a good scope for plinking? See Best .22 Scope and Best Rimfire Scope. If you properly sight in your scope, and your mounts, firearm and scope are of high quality, you shouldn’t have to zero your scope for another 2-3 years. When there’s enough force knocking your scope. Such as you dropped it.